Since 2013 you have been part of the Austrian Youth Climbing Team and winning last years World Youth Championships Combined in your category count to your proudest achievements. Now, the youth comp season 2018 is pretty much over which is also the end of your youth career and the final transition from being a junior athlete to a senior athlete. Looking back on all those years of being a young professional climber- which challenges did you face and how did you approach them? One of the biggest challenges is definitely the amount of competitions. Especially in my last few years as a junior athlete I had to participate in a lot of them. On the one hand I was allowed to compete in senior comps and on the other hand my coaches recommended me to participate in as many youth competitions as possible. The main difference between a junior´s and an opens season is, that the junior´s is usually not as “structured” as the adult´s one. 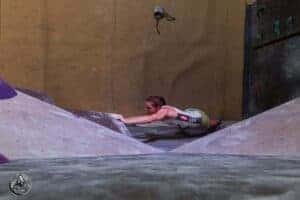 The adults start with a few Bouldering comps, followed by a few Lead World Cups which enables them to start their season with training for maximum power and to continue with endurance training before the lead comps with some speed trainings in between. This is different as a junior because the international lead, bouldering and speed youth comps alternate. Therefore, if you are going for the combined, you are expected to train for all three disciplines throughout the entire year. And if you are old enough to do some junior and adults´ comps, this intensifies even more. Most Austrian junior athletes go to a high school which is specialized on sports and making the combination of school with playing sports professionally as easy as possible. I didn´t, which made it even harder for me to balance education and sport. If I hadn´t been a rather good student, not really struggling with studying, I think this wouldn´t have been possible for me. Most of the time I didn´t even come home after school but went straight to training instead, eating my lunch in the bus and doing some of my homework on the side. After training, I’d finish the rest of my homework and my studying and then went to bed. As you can imagine, this is not only physically but also mentally really tiring. Therefore, it was even more important for my mental strength to regularly find some time to regenerate and do other things I love. 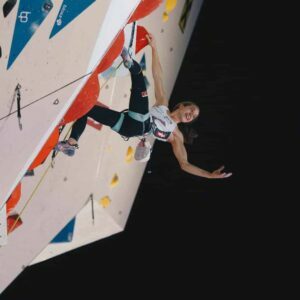 Speaking of mental strength – I also had regular mental training with a professional sports psychologist, who helped me to not only combine school and training and overcoming stressful times but also to handle nervousness in competitions which had a big impact on my climbing in former times. 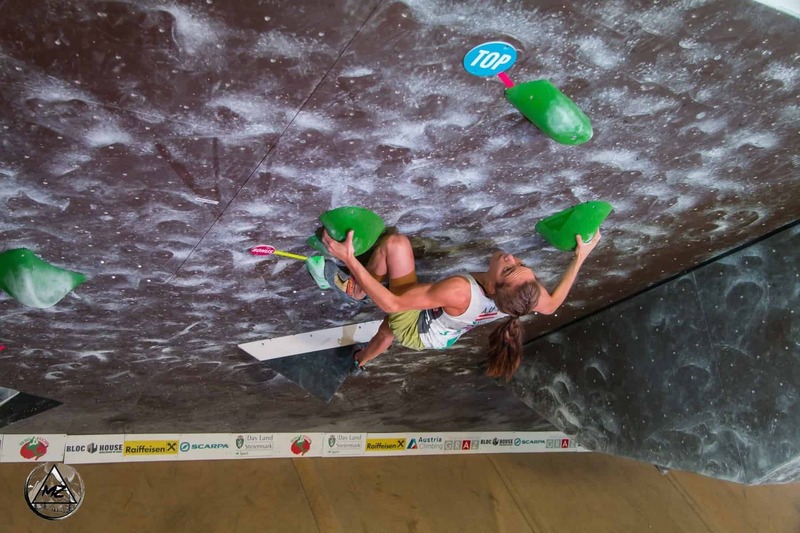 I didn´t have any pressure from somebody else, like my coach or my parents, but I myself put a lot of pressure on me and my climbing performances. I was really success-oriented which often made me feel really nervous before comps. With mental training, pursuing personal interests and engagement in mental strategies it has become a lot better and now enables me to climb with a more relaxed spirit. The good thing is that I barely had problems with my physical condition during my youth career. I was never seriously injured or ill which allowed me to climb without any forced longer breaks. The only small problems I can think of, were the ones related to growing. There was one year where I almost grew 10 cm and I can remember little pain in my back and my fingers. I also had a hard time estimating my height when I was reading the routes and boulders and sometimes got surprised how easy the seemingly far moves turned out to be. How might you have benefited from these experiences compared to young people who are not professionally involved in any sports? On the other side, do you also think you might have “missed out” on something because of your tight weekly schedule? I think I have already learned a lot from being a professional athlete. I know how to plan my daily schedule and to be consequent with it. As an athlete you also have to be self-confident, which can be a big advantage in other life situations as well. And not to forget all the different cultures you get to know when travelling to competitions in foreign countries – this is where the countless hours of training and stress definitely pay off! Personally, I don’t think I have really missed out on something during my adolescence. I never really hung out a lot with my classmates because they didn’t really understand what it meant to be a professional athlete. However, almost all of my best friends were climbers as well and members of the Austrian Youth Climbing Team. I could barely wait until the next competition or training camp and the good times I’d have with them. Nevertheless, I can imagine that some young athletes might have the feeling to miss out on something like going out or hanging out with friends. 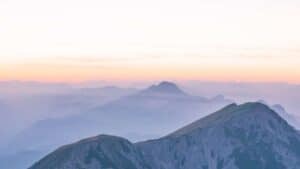 In my opinion, they have to keep in mind that sports/ climbing is not everything and if they really want to, they can always find some time to do other activities besides climbing. Who was your greatest support and did you have a role model who helped you meeting all your responsibilities? My biggest support definitely came (and still comes) from my parents who often used to belay me or drive me to different gyms. My mum is still some kind of a “manager” for me. But also my coaches and training partners have supported and motivated me immensely and had a lot of influence on who I am today. School done – time to explore the world! Climbing- team or single sport? 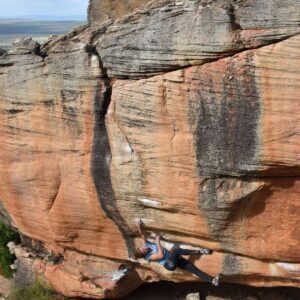 Rocklands- Bouldering paradise South AfricaSchool done – time to explore the world!